There’s no doubt that UDI is a hot topic among medical device manufacturers. They are currently under pressure to comply with the FDA’s UDI requirements. Europe plans to introduce similar rules that companies will need to adhere to in the next three to four years. Other countries like Brazil, Turkey and China are introducing their own rules. It’s clear that UDI isn’t going away any time soon. Medical device manufacturers doing business globally have a long road ahead of them and despite the growing regulatory complexity, manufacturers also need to ensure quality, streamline processes and keep an eye on costs. Here are some recommendations that will help you ensure quality and compliance with UDI labeling as well as streamline processes. The FDA specification requires the UDI to appear in both machine readable and human readable form. There is usually “human readable” content below the barcode, but this “human readable” content isn’t enough to be UDI compliant. This text is meant to be used if the barcode can’t be decoded by the scanner. In this case, the user would key-in the barcode content manually. 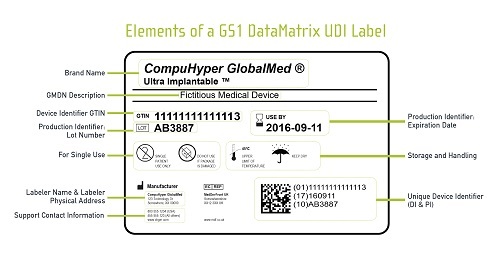 In order to be compliant, UDI requires the device identification and production identification data to be printed separately and clearly. This is because the medical staff that applies the device will not know the application identifiers under the barcode. The lot number and expiration date, in a special format, need to be presented very clearly on the label so the medical staff can quickly identify the data for patient safety. If the label contains multiple barcodes the medical staff may not know which one to scan. 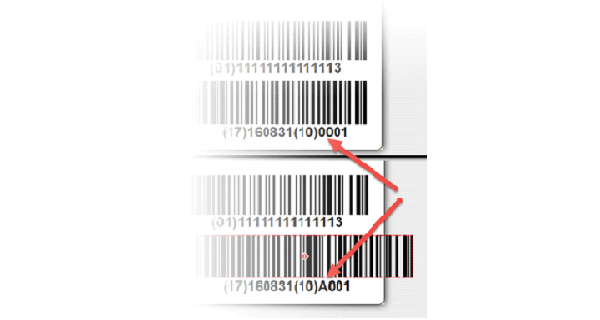 Barcodes can contain multiple pieces of data separated with application identifiers. The software that decodes the scanner reading can parse the data, eliminating the need for multiple barcodes. Best practice: Concatenate all data into a single barcode using application identifiers. Should you use linear or 2D barcodes? Both have advantages and disadvantages. Linear barcodes are more universal and can also be read by older and cheaper barcode scanners. The major disadvantage is the length of the barcode and the space it requires on the label. 2D barcodes can contain much more content in much less space. 2D barcodes can’t be read by old linear laser scanners. Although these days this is less and less of an issue. 2D scanners are now commonplace, affordable and available everywhere. Hospitals tell us that when they buy scanners, their preference is 2D. Best practice: if space permits, use the linear Code 128 barcode type, but make sure it meets the size requirements (see below). If you are unsure or if you have very limited space on the label, use the two dimensional DataMatrix code. Either way it’s a good idea to check the barcode quality with verification equipment or with your issuing agency. They may require you to pay a small fee for the verification. Note that if you are using GS1 as your issuing agency, you need to use subsets of Code128 or DataMatrix. In most label design software, there is a special GS1-128 barcode and a GS1-DataMatrix barcode. The software also takes care of the application identifiers and proper encoding. If you chose to program the label templates in the printer language, you’ll need to get an in-depth understanding of the GS1 system and encoding as well as the programming manual of the different printers you will be using. Also note that the application identifiers are displayed in parenthesis e.g. (10) in the human readable interpretation below the barcode, but the parenthesis shouldn’t be encoded in the barcode. Best practice: Use a label management solution (LMS) that includes label design software and the pre-designed UDI templates. NiceLabel’s label designer includes a wizard that makes it easy to create GS1 barcodes. This wizard seamlessly handles all of these nuances for you. You can download three examples of UDI labels here. There is another caveat with barcodes; the bigger they are, the greater the chance of fast and accurate scanning. For the GS1-128 barcode, GS1 recommends the following values for the x-dimension (X-dimension is the width of the symbol’s thinnest bar also known as the narrow bar). For the GS1-DataMatrix barcode, the recommendation for the x-dimension (size of the smallest dot in the code) is 0.300mm (0.0118 inch) (0.2mm for direct marking of small medical devices). These values are guidelines. In reality, you may not have enough space and the barcodes will be smaller than these requirements. If the print quality (contrast between black and white lines/dots) is good, a decent scanner will still be able to properly read the barcode. With some label design approaches, you risk creating a label that doesn’t match the printer’s correct dots per inch resolution (dpi). This can happen when creating a PDF or when hard-coding a printer template using the printer’s command language. Designers usually optimize PDFs for high resolution laser printers 600dpi/1200dpi/2400dpi. When you print PDFs on a label printer with 203dpi or 300dpi, the very narrow bars in the barcode cannot be printed at the proper resolution, making the barcode difficult to read or even unreadable. Similarly, when you program using printer commands, you need to have the DPI and barcode dimensions in mind. Best practice: use a label management solution (LMS) that includes a label design application that makes it easy for business users to design compliant UDI labels. You don’t need to worry about the printer model and resolution at design time as the label templates are universal. The NiceLabel LMS optimizes the print stream dynamically for the target printer just before printing, which ensures the best printing quality and maximum performance. This error is common when label templates are programmed using the printer’s command language. 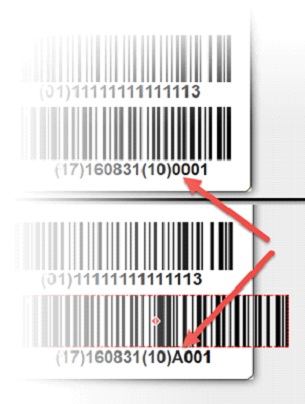 Barcodes can stretch over the edge simply because a value changes from numeric to alphanumeric. In the example below, changing the LOT value from 0001 to A001 extends the barcode. You can avoid this problem by printing labels using an LMS. With NiceLabel, you can set the barcode to always fit into the designated area. NiceLabel is a leading developer of label and marking productivity software solutions that help companies reduce complexity and mitigate risk while meeting compliance requirements and increasing productivity, quality and agility. To learn more about UDI compliant labeling visit www.nicelabel.com/udi.